Like most kids in Nightmare on Elm Street movies, Kristen starts having dreams about Freddy. She is the last of the children of the people who burned Freddy alive, so you can understand that he's still angry about that and so that is why he wants to kill her. And so our movie begins. The first Nightmare on Elm Street buries its excellent concept under a heap of poor dialog and hammy acting. But it gave us Freddy so I will forgive it. The second Nightmare movie is just a great movie, and as far as I am concerned is what an Elm Street movie should be. It's scary and the script is surprisingly good. 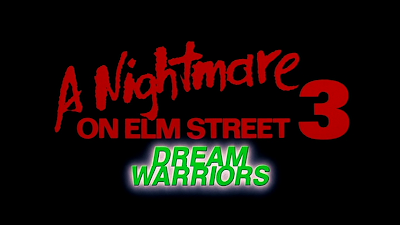 So what does Dream Warriors bring to the table? Well, it brings Dream Warriors. Nancy, from the first movie, comes back as a dream doctor or some nonsense like that, and teaches the kids to use their Dream Powers. -Taryn: Power of Beautiful... and Bad! -Phillip: Power of Getting Killed First! -Jennifer: Power of Jumping Headfirst Into Wall-Mounted TV To Death! -Will: Power of Dungeons & Dragons! -Joey: Ultra-Specific Power of Screaming To Break Mirrors Freddy Has Pulled Your Friends Into! Somehow, half the kids manage to make it through the movie and anyway the extremely awkward and embarrassing scene where they all explain their new found powers to each other is wonderful. This is the Elm Street movie where they started not only tailoring the death scenes to each character, but also telegraphing those scenes constantly up until they happen. So the girl that used to be a junkie on the streets and has scars all over her arms from needles... you can be sure that Freddy is gonna use that in some way to kill her. So in other words, this is where the series turned off horror street, and took detours down groanworthy oneliner avenue, grotesque death scene boulevard, and awesome special effect lane. The special effects are amazing! I will never trust CGI effects: the minute you trust them, bam, there goes your wallet and now your fish are dead. But you can trust puppets and matte paintings and guys covered in slime. You can trust them forever! So is this movie any good or what? Well, as I mentioned before Nancy is back and Wes Craven from the first movie is involved, so it has more in common with that than it does with the awesome second movie. So for every amazing scene of some guy being controlled like a puppet with his own veins torn from his limbs, you get a scene of Nancy empowering the kids with her crazy dream logic. Oh Nancy, all your friends died in the first movie and you didn't even manage to kill Freddy with your laughable Home Alone booby traps. Why should we listen to you? How could you review this movie without mentioning this? !